I'm always amazed when Linz says something like, "Mom....remember when we went to.....(insert place here)....back in (insert year here)? That was when I (i.e....ate bacon for the first time!") I swear she remembers EVERYTHING! Places...dates.....the weather that day....what she was wearing.... It's scary! I mean there are days that stand out in my memory.....some more so than others. Sometimes, like lots of people, I even remember random things. I tested my knowledge against hers. 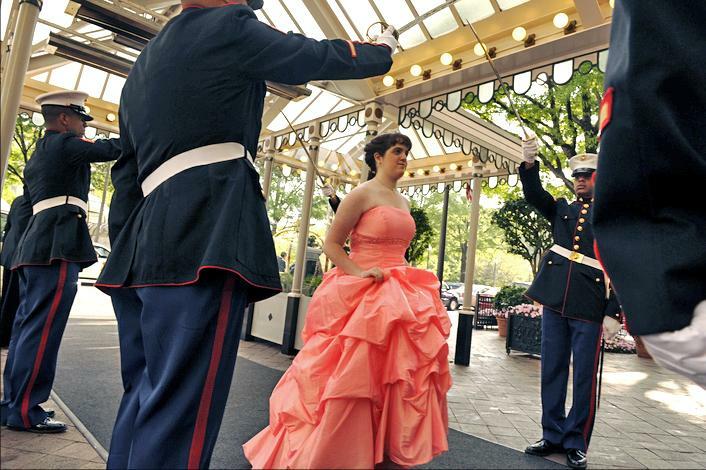 I remember when she went to "The Cinderella Ball"...I mean who wouldn't. It was magical. I asked her if she remembered when it was and she said, "Sure I do. It was May 31st, 2008." She also remembered that it rained that day before the ball and also that our friend's daughter was born that day too. I had NO clue. Today we were going to go out to Kohl's and Mike and I decided we would take the kids to eat at Five Guys. Zach was SO excited because he LOVES burgers. I wasn't sure how Linz would react but since they serve hot dogs it was all good. On the drive over she said, "Boy, Mom, I remember the first time I ate at the Five Guys." I said, "Really? When was it?" She said, "It was in 2008". I laughed and said, "Are you kidding? You really remember that?" She said, "Yep. It was the day before school started. I sure loved that hot dog and wearing the shorts". Um.....ok. I found myself "double checking" Lindsay's "facts" about the ball and I came across this video I made for her after the ball. I watched it and cried again just like I've done many times before. What an honor it was to be her "date" for that magical night. For more info on "The Cinderella Ball" and other opportunities for special needs kids in the Northern Virginia area, contact "The House" in Woodbridge, VA. What a fantastic organization. This is mostly a post for my own "memory". I, for one, have to write things down to remember them! I feel blessed to be able to blog about life and "stuff"....just for me. (and my mom who is probably the only other person who reads this. ;-) ) It's a nice way to journal things that might fade and I really want to remember and cherish each one. 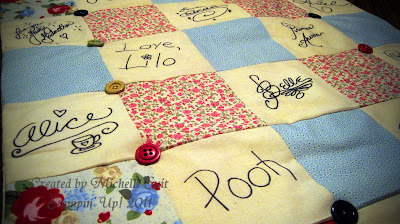 This is a small Disney Autograph Quilt made with the NEW "Springtime Vintage" Fabric and matching buttons from Stampin' Up's Occasions Mini Catalog. 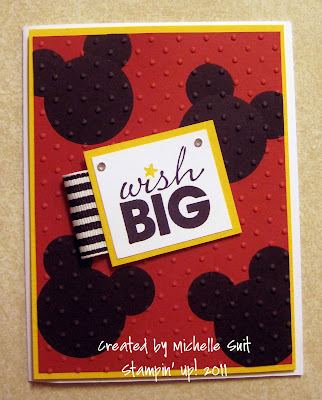 I know it's no surprise to hear that we've been to Disney a lot.... We've done lots of different "takes" on collecting character autographs....books....hats....colored cardstock for scrapbooking..... etc. So one year I decided that I'd take pre-cut quilt blocks and a fabric marker and have the characters sign them. I can't tell you how many compliments we got from other guests, cast members and even the characters themselves. Once I had them all at home, I put them on my light table and made a template of each one on plain white paper to keep. 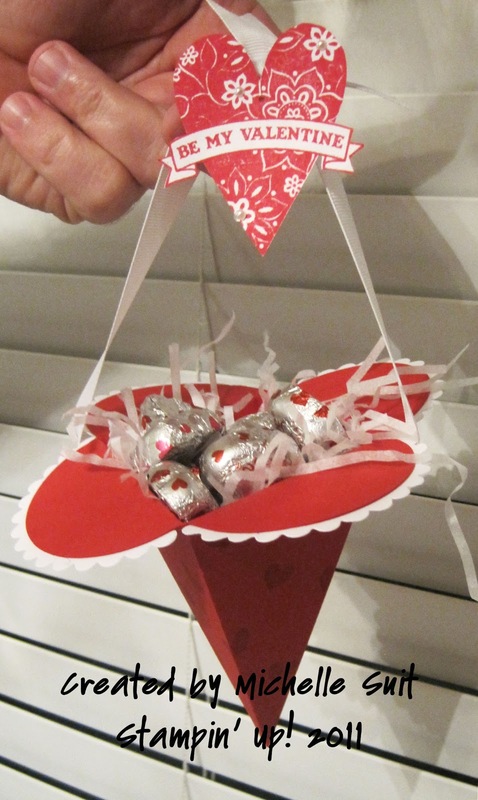 I've used them several times to make gifts for some of our friend's children. 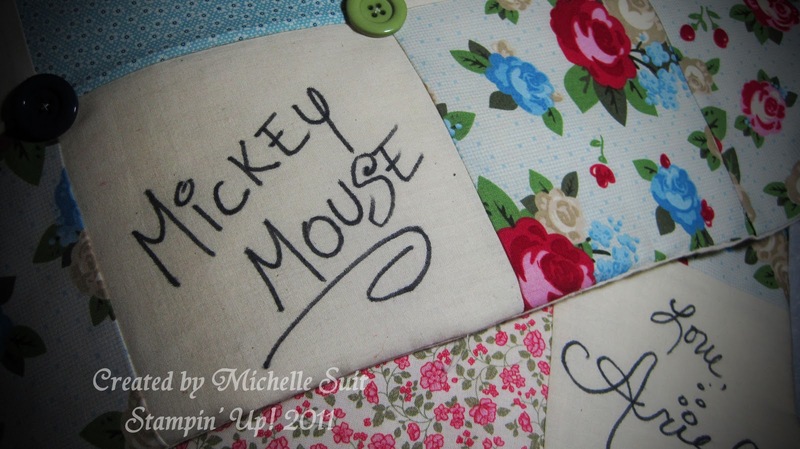 It's such a cool gift to give and I love making them. So I decided to try a small one and see how it would turn out. 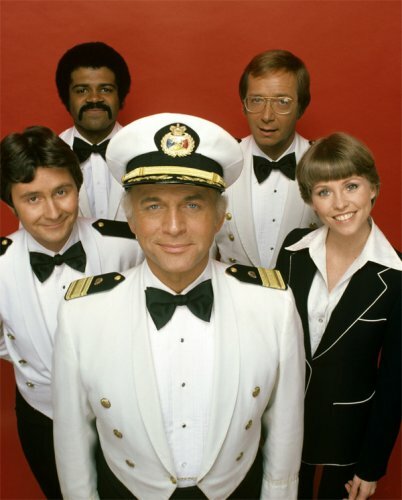 I picked some of my favorite characters and I smile just looking at it. The colors are so cheerful and the fabrics remind me of the "shabby chic" style. What a perfect day! No school and time to craft to my heart's content. I wanted to make sure I kept a picture of this sweet, plaid blanket. I found the pattern online and I had to try it. I've never crocheted a plaid pattern before and I really love the way it turned out. I'm not sure I'll make another one like it again any time soon but.....I'm glad I have the photo to keep. This one is for my friend, Lindsey, whose little girl, Olivia, is due next month. I went to Pottery Barn Kids and matched the yarn to the crib bedding so she'd have and extra "schmoodgy" blanket in there for her sweet little girl. I can't wait to meet her! Here's a picture of the bedding and one of the blanket I made. 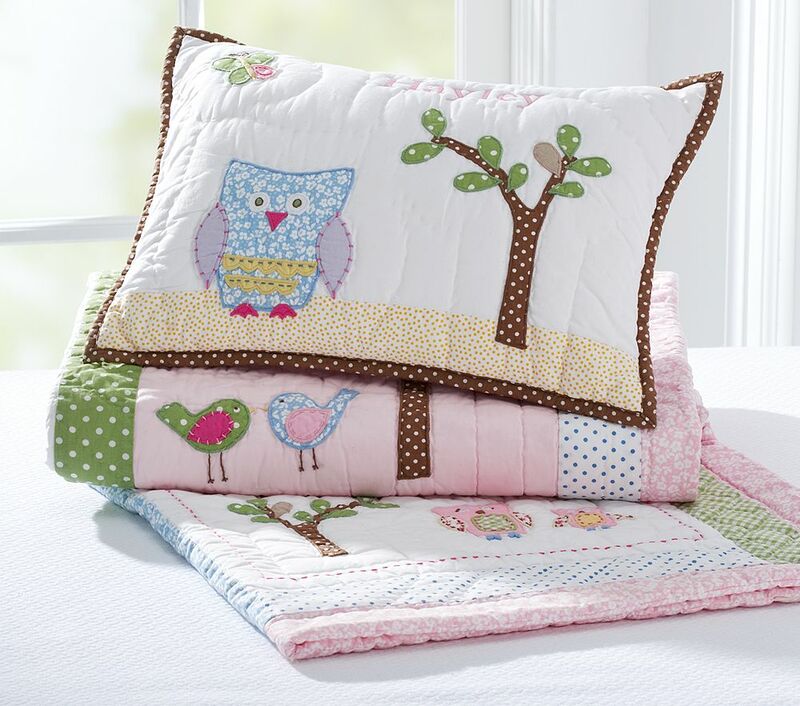 This set is called "Hayley" and is from Pottery Barn Kids. LOVE IT! 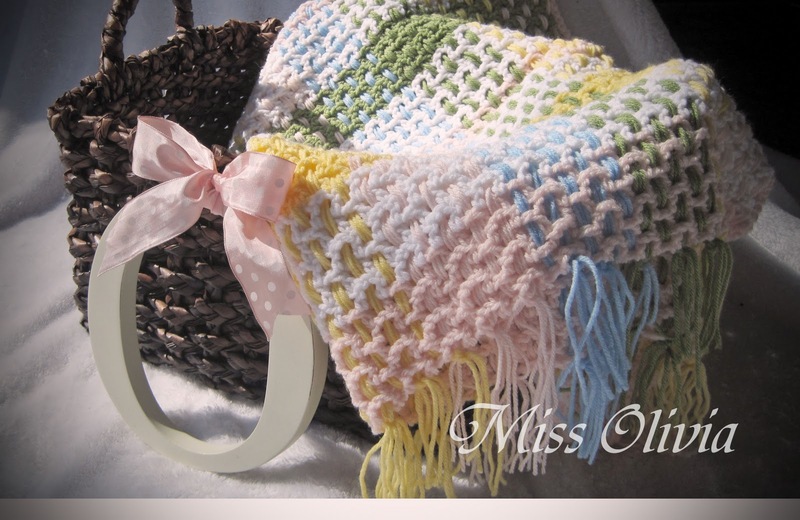 Here's Miss Olivia's Plaid Blanket in a basket I bought for her nursery. I couldn't resist the wooden monogram "O" from Pottery Barn Kids. Love that store!! Hope you have a magical day! Spring is in the air? Well listening to the blustery wind outside my window this morning I don't think spring is here quite yet. The last couple of days have been a nice tease though. 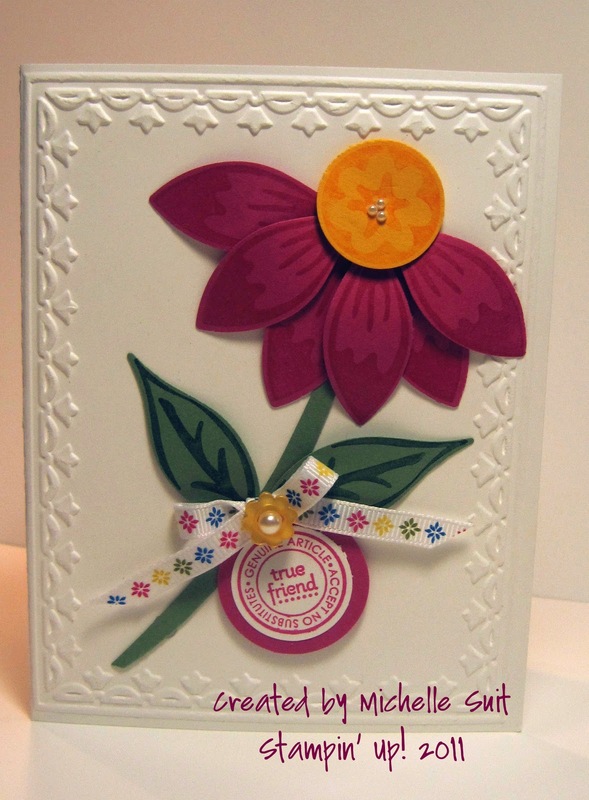 I was working on new designs this morning and I had been just itching to use my "Build A Blossom" stamps and Punch. I'll admit it....I'm addicted! I used my handy dandy Big Shot and the Tulip Embossing Folder on the Whisper White card base. I wanted it to be simple and clean. Then I stamped the petals, leaves and the flower center using the "color on color" technique. After punching out the pieces, I adhered them with glue dots after "bending" them a little with a bone folder to give them a 3D effect. I used the "True Friend" stamp from one of my favorite Sale A Bration stamp sets, "Punch Bunch". Then I finished it off with the "Ice Cream Parlor" ribbon and buttons that I got FREE from Sale A Bration. YAY! The Ice Cream Parlor Designer Paper is adorable and I'm almost out of it! I need to add it to my Wish List. I had so much fun designing this card and it definitely made me feel like those warm spring days are just around the corner. Wherever you are and whatever you do today....make it a great day! Good Morning All! Happy Tuesday! I've scheduled a second class! Tuesday, March 1st at 7 p.m. here at my house. 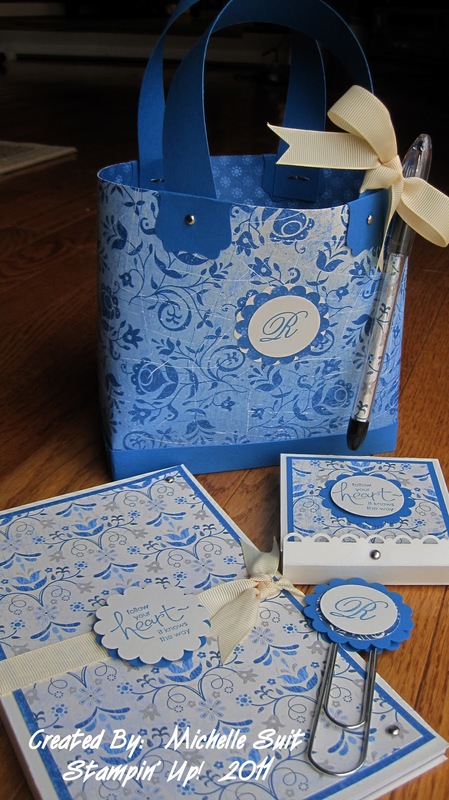 We will be making a darling "tote" with matching notepad and pen with the awesome Designer Series Paper from Stampin' Up! They are just adorable and I can't wait to share the patterns and info with you. The Post It Holder and bookmark aren't included in this stamp camp. 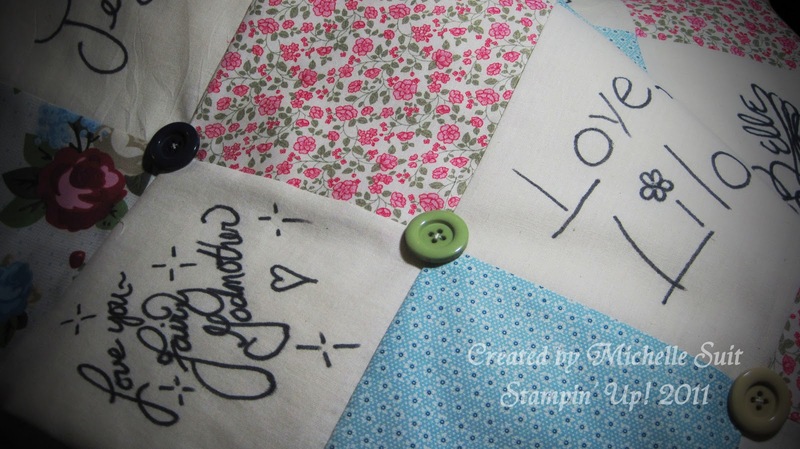 So.....come stamp with me and have fun just getting those creative juices flowing! There are 10 spots avaiilable in this class. Please include the number of totes you will be making in your RSVP. Papers will vary. Hope to stamp with you soon! So I'm "Julie McCoy~Cruise Director" now more than ever. Linz started asking lots of questions last night and has been really twitterpated about it all. She's "very worried about Dad"......(too many concerns to list here.... Zach just keeps saying, "Dad's at work?.......Dad's at work?" Long story. Just a fun adventure in Autism. Anyway....as a "just keepin' them busy" activity today we headed out and about to Barnes and Noble (which incidentally made me the "best mom ever"...or so Linz said), we went to lunch at Cici's Pizza and ran a few other assorted errands. I told her before we left home that she could pick out a couple of new books at B&N because she was being such a great helper folding clothes and emptying the dishwasher this past week. She was SO excited. We got to the bookstore and as we were walking in she said, " I remembered to bring my purse". Well....I didn't really think anything of it. We went inside and they both looked around and Linz found 3 chapter books she wanted. She came rushing over to me at one point waving a book and said, "Mom! I found it! I found the Beverly Hills Cha Hoo A Hoo A book!!!" That would be Chihuahua in English. :-) We went up to the register to check out and she went ahead of me. The guy rang up her books and she started opening her purse. I said, "Oh, do you still have a gift card from Christmas?" She said, "No, I have money". Hmmm....I don't remember her coming into any money recently but....ok. The cashier said, "That'll be $15.42". Linz looked at him and pulled out a five dollar bill out of her wallet and said, "Well I'll give you $5.00. That's all I have. It's my best offer." He said, "Excuse me??" I jumped in and said, "Remember Linz, I'm buying them for you today as a reward for helping." (I figured I'd explain the whole "no money....no merchandise" thing later. You know how you look at kids and think "Aw, she has her mother's smile" or 'He laughs just like his dad"....? Well, Lindsay inherited her giddy laugh inability of "lyric" correctness (or in this case....dialogue correctness) from her Dad. I haven't made a list of most of her (ahem...) substitutions but tonight's is one that I had to write down. Linz and I were acting like proper ladies crazy people when I got home from work today. We were running around...chasing each other and we ran up and jumped on my bed. We were laughing SO hard...tickling each other and we heard Mike come in the door from work. So we did what any self respecting, crazy girls would do....we dove under the covers to hide until he came upstairs. Let me just say here that Linz is NOT very good at remaining "under cover" and quiet. So....Mike came upstairs and immediately pounced on the bed and started yelling, "Now WHERE are those girls?????" Not to be outdone and being quite the knight in furry armor....Marley came bounding upstairs and jumped in the middle of the pile. Actually he missed me completely but he landed right on Linz...in areas too private to mention here. She let out a very loud shriek and said, "Marley!!! You got me right in the TIMBERS!" (Here's why there's a picture of Po, the Kung Fu Panda on this post. 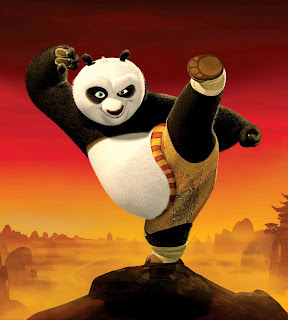 There's a point in the movie where Po gets hit in....well....a guy panda's private area and he says, "OWWW! My TENDERS!" We laughed SO hard that we could could barely breathe and Mike said, "Ok....now THAT'S a Linz Quote of the Day!!!". I'm getting ready for this week's "My Funny Valentine" Stamp Camp here at my house and this is one of my new designs. I always come up with waaaaay too many designs and have to narrow it down. This time I just can't walk away from Owl Punch! 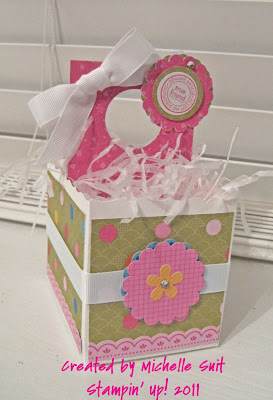 I was SO excited when I opened up the Sale A Bration catalog and saw the new "Punch Bunch" stamp set. Yee HAH! 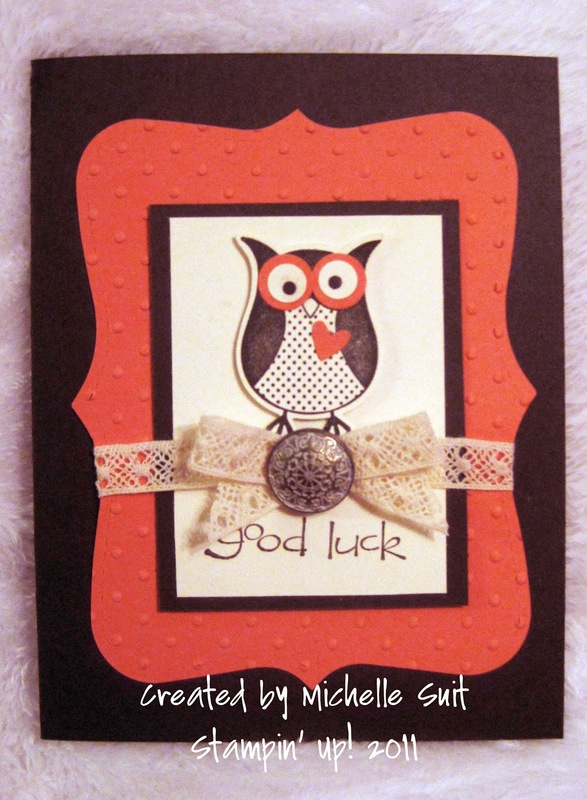 There was my cute lil' owl ready and waiting. So here's the first card I came up with using the owl from "Punch Bunch" and the Owl Punch. (Whew! That's a mouth full!) I used the punch to create the eyes and make them 3D and I also used the punched heart. I addedthe crochet trim and Antique Brads to finish it off. I hope you like it! Hello All! (I laugh when I write that because I really thought my Mom was the only one who read my blog....but I've really loved and appreciated all your sweet notes and comments telling me that YOU actually read it too!) Who knew? I'm working hard in my stamp room tonight (and will be LATE into the night) getting ready for an ALL DAY scrapbook crop tomorrow at Manassas Mall. 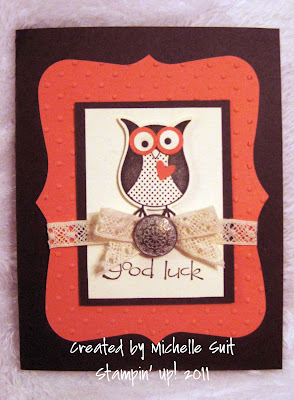 My wonderful friend, Maria, invited me to come and bring my Stampin' Up! "stuff" and set up a table at the crop. I can't wait to share what I love!! I have lots of cool projects and samples to display and have been working on a "make and take" for the croppers to ...well....make and take home! I've heard that there will be 33 croppers there!!!! WOW! I can't wait. I thought I'd post the card I designed today (when I was supposed to be getting things packed...) when I had an idea for a card using TWO of the things I love.....my BIG SHOT....and DISNEY!! It's my little shout out to the "House of Mouse" today. 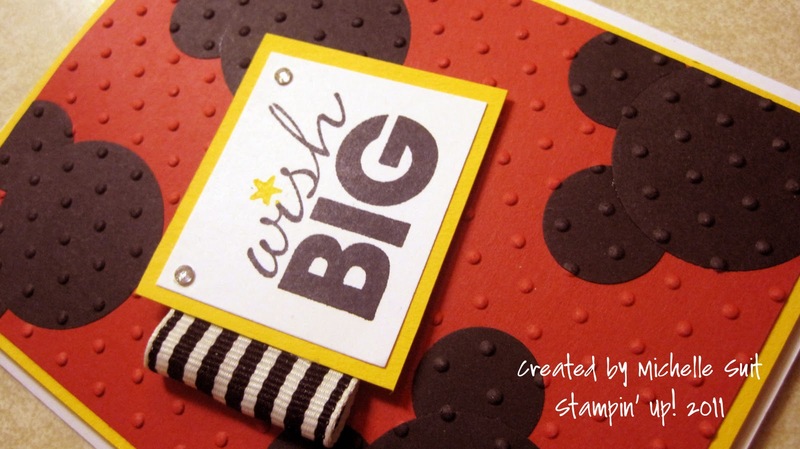 I have to say that my absolute favorite embossing folder for the Big Shot has to be "Perfect Polka Dots". I love the way it turned out and I hope you do too. Big Shot = Big Fun! Lots going on here in the stamp room! 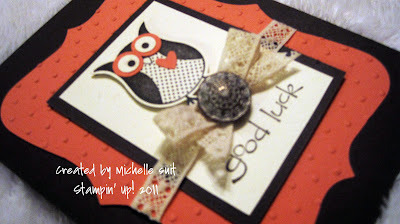 I've been having so much fun working on new project ideas for my upcoming stamp camps. Here are two of them.